Spotlight on Creative Pretend Play (Hottest Holiday Toys Awards) - Mamanista! Children are naturally creative. A few well-chosen toys are great “props” for their imagination. The Creative Pretend Play Winners from our Hottest Holiday Toys Awards all support role playing, creative exploration, and discovery. 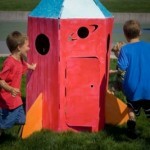 Color Me House ($40) has an eco-friendly alternative to pricey, plastic play houses. 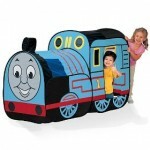 Plus, your child gets to decorate with friends. We like the rocket ($50)–blast off! Future fashion designers will be inspired by Harumika, a mannequin wuth a rubber “style lock system” for no-sew styling. (see the full review for a video of Harumika in action). Harumika even has social site where kids can share their designs. Starting at just $11 (Amazon), Harumika sets are a creative gift that won’t break the bank. 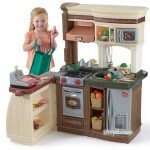 Last year my daughter found the KidKraft Red Retro Kitchen (Amazon – $210) under the Christmas tree and it is still one of the slickest-looking wood kitchens on the market. This year, the brand new Step2 Fresh Market Kitchen (Step2.com – $200) has won smiles at our house for its 360 degrees of play possibilities. 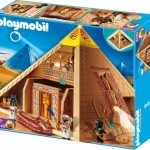 Another instant classic from Playmobil, the Playmobil Pyramid has so many secret passageways and trap doors to keep all kids, ages 3 and up, entertained for hours. Works on husbands, too.